Dishes of 100cm wide are called 110cm. You get the idea. 1.9 metre offset dishes are really 1.8 metres. Famaval or “Portugese” “1.9” circular, or prime focus, dishes are really 1.8 metres. They have a wide non-receiving rim. Some unscrupulous installers lie about the size of dish installed, confident that no-one will go up on a roof with a tape measure. Even professionals find it hard to judge dish size from street level. Circular, or “prime focus”, dishes are less efficient than oval, or “offset” dishes. A 1.8 metre circular dish will not work as well as a 1.8 metre oval dish, which at 1.8 metres x 1.9 metres, has a greater surface area. Most installers warn you that your dish may be only just big enough for dry weather. You may be told you have no "rain margin". You may be somewhat surprised that the BBC picture breaks up in the evenings every day. If your dish is undersized, you will lose picture at regular times of day. Very few installers warn you that reception is worse in the summer and best around Christmas, and that every six weeks or so it will change for the worse or better. 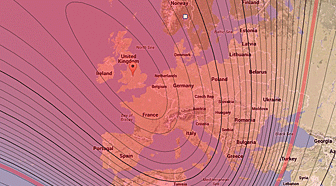 No one at all will warn you that twice a year at the equinoxes, BBC and ITV signals in many areas of Europe including Spain disappear entirely for 10 minutes every morning, for five days either side of 6th. March and 8th. October. Low Noise Blocks (LNBs) become slowly cooked in hot, sunny countries. Few make it past five years, and if they do, they lose efficiency. Cables laid over a hot flat roof may suffer the same fate. After 10 years, there might be no insulation left and the signal may disappear every time it rains. Dishes installed between 2nd February 2012 and 6th February 2014 may have worked well with Astra 1N, which was easily receivable on 70 cm dishes in most of continental Europe. This has left many unable to receive BBC and ITV after the recent switch. It was clear from late 2012 that things were going to get much more difficult with Astra 2E. A few installers chose to ignore the warnings and carried on regardless.